Alexandrite is a variety of chrysoberyl with a definite colour change due to the presence of chromium traces. The different colours appear due to the light source under which the stone is observed. The effect depends on the amount and distribution of colour-giving trace elements. The two colours are usually blue-green in daylight and purplish-red in incandenscent light. 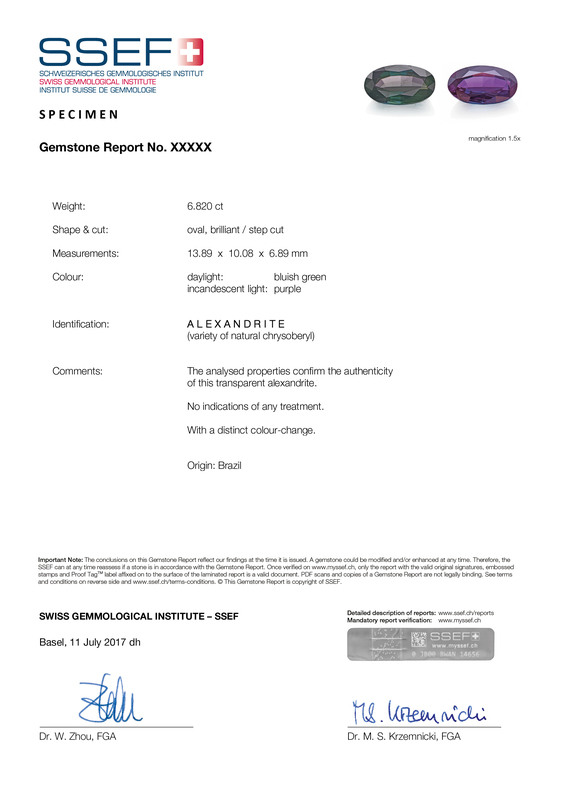 The SSEF report number is the number given to the alexandrite when it is submitted for testing, and is a unique number. If an item is resubmitted later for a ‚recheck‘ after re-cutting or for a report update then the item obtains a new report number. The photo of an alexandrite in the two lighting conditions (daylight and incandescent light) depicts the gem at the time of testing. The photo on an SSEF report is for representational purposes and does not necessarily represent actual colour, clarity or size. For size comparison purposes, approx. magnification used is provided under the photo on the report. Weight of an alexandrite in carats, measured and stated with 3 digits. In the case of mounted jewellery, total weight corresponds to total weight of jewellery item(s) and is stated in grams. Estimated weight is an estimation -for example- for stones mounted in jewellery. The actual weight of a stone may be different to the estimated weight and can only be determined unmounted. If the colour change is deemed sufficient (it must be obvious with the light source and both observable from approx. 20 cm distance), then for an alexandrite the colour on a report is given both under daylight and incandescent light. These two colours correspond to the colour-change range. The degree of colour change is detailed in the comments of the report. SSEF differentiates between moderate, strong and distinct colour-change for alexandrite. A weak colour change is not mentioned on an SSEF report, and such chrysoberyls are not considered to be alexandrites. A chrysoberyl with insufficient colour-change or not matching alexandrite trace-element chemistry would be identified as chrysoberyl in the identification section of an SSEF report. A synthetic alexandrite would be clearly identified and labeled on a report in the identification section. Treatment detected in an alexandrite (including fissure-filling) would be written in the comments section of an SSEF report. If no treatment has been identified ‘no indications of treatment’ would be written on the report.